The Ukraine crisis began with the downfall of a domestic politician, but has since transformed into a global battle over competing historic claims. With cameras focused on the masked men storming buildings in southern and eastern Ukraine, the views of the general population across the country have often been drowned out by the violence and superpower politics. While some have claimed that public opinion holds little sway in Putin’s calculations, our new survey for CNN suggests that possible attempts by Moscow to defuse the crisis would be grounded in a sensible reading of the limits of popular support for Russian intervention. ComRes’s nationwide survey took place between 7th and 11th May and is one of the first published polls in Ukraine since the crisis began. It included both Russian- and Ukrainian-speaking respondents in all regions of the country, including Crimea. Most will have read that the West of Ukraine has a larger Ukrainian-speaking population which tends to support pro-European parties and candidates, while Russian-speakers in the East and South look towards Moscow. Our results generally support this view, but suggest the picture is more complicated. The majority (60%) of Russian-speaking Ukrainians feel a stronger sense of loyalty to Ukraine than to Russia. This finding will be reassuring not only for the Ukrainian government, which has expressed concern that Putin could use defending Russian speakers as a pretext for further military action, but also for regimes in other countries with large ethnic Russian minorities. It strongly suggests that the idea of Ukraine splitting into majority Russian and majority Ukrainian states would go against the wishes of many ethnic Russians, and certainly calls into question the results of last weekend’s referendum in Donetsk. Indeed, when asked whether joining the European Union would be good or bad for Ukraine, more than half (54%) of all Ukrainians believe joining would be good for the country, including a third (33%) of Russian speakers. A strong argument has been made in places like Latvia, Lithuania, and Estonia that even the Russian minorities recognise the economic benefits that European Union membership has brought. This should not be taken as a green light for the EU to fast track accession, though. Outside the North and West of Ukraine, many people prefer a position of neutrality rather than aligning with the EU or Russia – 55% preferring this option in the redrawn South of the country (without Crimea). Holding the country together will require a pragmatic approach to such questions, preferring consensus and compromise over taking sides. A Unifying Candidate in the May Elections? The poll shows that while Acting President Oleksander Turchinov is enormously popular in the North (63% favourable) and West (69%), the rest of the country is much more divided, with even a third (32%) of Ukrainian speakers feeling unfavourable towards him. The pro-European Turchinov stepped in after former President Viktor Yanukovych – a Russian speaker and former governor of Donetsk Oblast – was ousted in February. Our survey reveals that few current leaders inside or outside Ukraine look capable of commanding popular support across the country. Finding a unifying figure before the 25th May elections seems unlikely, so the country will need to focus on the “national dialogue” emphasised by German Foreign Minister Frank-Walter Steinmeier. 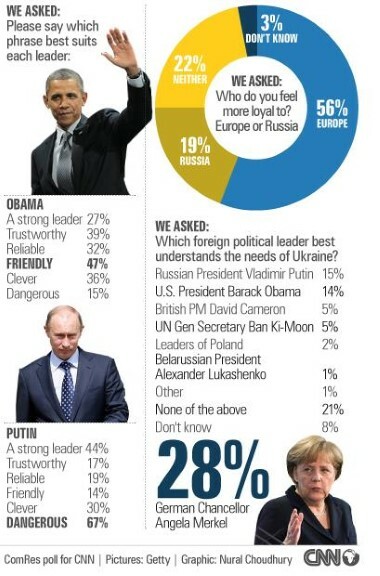 Indeed, the foreign political figure most widely seen to understand the needs of Ukraine is German Chancellor Angela Merkel (28% – versus 15% choosing Putin, and 14% Obama). A third (35%) of people in Ukraine feel the UN’s response to the crisis has had “no effect at all”, and only 5% choose Ban Ki-Moon when asked to name the foreign statesman who best understands Ukraine’s needs. Yet a UN or international coalition presence in Ukraine is perceived to be a more effective solution (41% good, 33% bad) than economic sanctions against Russia (34% good, 29% bad), a NATO military presence (33% good, 48% bad), or a Russian military presence (7% good, 82% bad). One of the big challenges for international organisations will be the likely rise in Internally Displaced Persons (IDPs) as people flee communities where they feel under threat from the majority ethnic group – a feature of similar conflicts in Azerbaijan and Georgia. Racial tension has the potential to polarise the East and West of the country yet further, with 54% of Ukrainian speakers saying they are unfavourable towards Russians in general. Dealing with the post-conflict turmoil within Ukraine will be an important opportunity for the UN and organisations like the OSCE to prove their worth. Economic confidence in Ukraine is surprisingly high, with two thirds (67%) saying they feel optimistic about the country’s economic future. However, only a fifth (20%) say they feel very optimistic, and this dips to 15% among young adults aged 18-35. As Russian Prime Minister Dimitry Medvedev yesterday instructed Gazprom to supply gas to Ukraine only on a prepaid basis, and the West tightens sanctions against Russia, businesses with interests in the region will be keen to minimise any commercial and reputational risk. Europe’s dependence on Russian gas is also a double-edged sword. As the Economist has noted, the shock of the Crimean annexation should “speed up European decision-making on storage, interconnection, diversification, liberalisation, shale gas and efficiency.” The changing energy landscape could have a profound effect on business interests across Europe, the Middle East and Western Asia. Ending on a note of optimism, four in five (82%) say they are optimistic about the future for themselves and their families. The figure is consistent across all the country’s regions and demographic divides. It suggests that while the kaleidoscope has been firmly shaken, ordinary citizens still expect the pieces to settle in their favour. ComRes interviewed 1,000 Ukraine adults aged 18+ by telephone between 7th and 11th May 2014. Interviews were conducted by native speakers of Ukrainian and Russian. Quotas were set on age, gender, region and settlement size in line with official statistics. Data were weighted demographically to be representative of all Ukraine adults aged 18+.